57% of you aim to be pertinent, that is, keeping in touch with current trends, but not losing yourself in the rat race of popularity. You could tell us what’s happening in the world, but we probably won’t catch you wearing a steak suit to preach in. 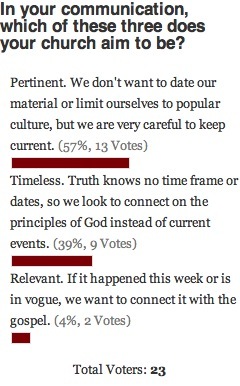 Another 39% of folks who responded say their church aims for timelessness. Maybe you’re just out of touch, but more likely, your churches connect with God on a level that is outside of today’s trends, which can be relevant, although in a different way. Lastly, 4% of respondents aim to stay in vogue with what’s happening right now. Your churches are adopting new technologies, keeping pace with culture and connecting the gospel with what’s happening in the world right now. In this week’s poll, we’re looking for a progress update: How is your church progressing in the world of church marketing? Head to our home page to weigh in for your church now. Not a big fan of the word pertinent–I think it’s a backlash to churches being accused of not being relevant. Pertinent, to me, is a stodgy word. Nobody says it–how about this–it’s isn’t a relevant word. ha-ha. When I hear pertinent, I hear squeaky and terse. Just a emotional thing, which I think is really pertinent in communications.